Ayurveda has its own view to understand the development of human body and its various organs. As the quotations are in a concise manner, it is essential to amalgamate the basics stated by various Acharyas with comprehensive explanation of modern science. The liver is a vital organ for metabolism. Acharyas have opined about the genesis of Yakrut (liver) from Rakta Dhatu (blood tissue). Parallel opinion in conventional anatomy states that abundant quantity of blood is responsible for the formation of sinusoids of liver. This huge quantity of blood comes from broken viteline and umbilical veins in the septum transversum. On the other hand, the raw material for the formation of blood cells and liver (septum transversum) is the same, being mesenchymal cells from the mesoderm. The present review was conducted to discover the similarities about the genesis of liver in the opinions of ancient and conventional medical science. This may be useful for utilizing the ancient medical science in a new perspective. Therefore, it is attempted to correlate the genesis of liver in Ayurveda with modern science. Background: Looking at the current scenario of shortage of public health professionals on one hand and intense demand of community health services on the other it is imperative that the contribution of Ayurveda practitioners is increased in the field of public health. However, the updating of the knowledge of public health issues and concepts will ultimately decide whether they can be successfully integrated into the community health arena or not. Aim: This study was conducted to assess the knowledge level of Ayurveda practitioners about public health Issues with the aim find out the competence of Ayurveda practitioners regarding knowledge of public health issues. Materials and Methods: Cross-sectional study was conducted in the union territory, Chandigarh and two districts each of the states of Haryana and Punjab. Public health knowledge assessment tool comprising a questionnaire was used to collect information from the respondents who were registered Ayurveda doctors and interns. The data was analyzed with the help of IBM SPSS (Statistical Product and Service Solutions) . Results: The respondents scored between 5 and 17 points out of a total of 19 points and majority (82%) of the respondents fell in the category of "having average knowledge". The mean score was 8.42 ± 2. Conclusion: Curriculum and training of Ayurveda education need to have more public health related inputs and hence that the Ayurveda practitioners are well-versed with the public health concepts and could contribute in the public health field meaningfully. Background: Hemoglobinopathies constitute a major public health problem internationally, particularly in the developing world as it has the least resources for coping with the problem. Thalassemia is an inherited single-gene autosomal recessive disorder of the Red Blood Corpuscles (RBCs). Life becomes miserable due to blood transfusion every fortnight, recurrent infections, stunted growth, problems of iron overload, splenectomy, and decreased school performance. Nearly Rs. 1000 Crore is being spent in the treatment of thalassemia per annum. Aim: To evaluate the efficacy of Triphaladi Avaleha in Beejadushtijanya Pandu (thalassemia). Materials and Methods: Total 32 patients of age group 1-15 years were registered and randomly divided into two groups. Group A (test drug treated group) and Group B (control group). In Group A, Triphaladi Avaleha was given with Godugdha, and in Group B, Deferiprone was administered. Assessment was done based on the subjective and objective parameters after 12 weeks of treatment, with a follow-up of 8 weeks. Results: The trial drug proved better than the standard control in Paandutaa and Sandhishoola at a highly significant level and in Jwara, Akshikootashotha and Pindikodweshtana at a significant level. In Group A, five patients (38.46%) showed maximum improvement, five patients (38.46%) showed moderate improvement, two patients (15.38%) had mild improvement. 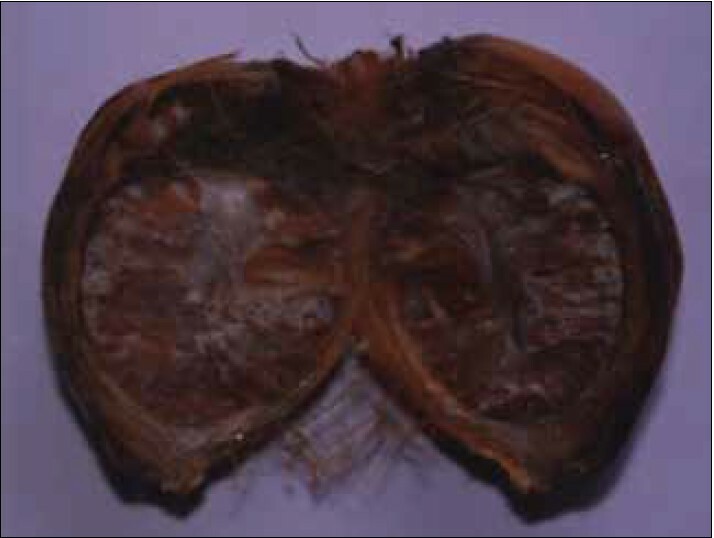 Conclusion: Triphaladi Avaleha has various properties which help to relieve the signs and symptoms of the disease, as well as decrease the iron overload. Background: Myopia is very common ophthalmic disease especially in children and adolescence. In Ayurvedic texts, only by the main feature impairment of distant vision myopia can be correlated with Drishtigata Rogas (2 nd Patalgata Timira). Aim: To compare the effect of Saptamruta Lauha and Yoga therapy in myopia. Materials and Methods: In present study, a total 60 patients with age group between 8 to 30 years were selected randomly from the out-patient Department of Swasthavritta and Shalakyatantra Department of Government Ayurveda College, Trivandrum, and were divided in two groups. In Group A, Saptamrita Lauha 250 mg twice daily with unequal quantity of honey and Ghrita was administered while in Group B, patients subjected to Yoga therapy (Jala Neti, Nadi Shodhana, Shitali Pranayama and point Tratak) for 3 months duration with 1 month follow-up. Results and Conclusion: The result obtained from the study reveals that there is no significant reduction in the visual acuity and clinical refraction, but associated changes were observed as reduced in group B when compared to group A. However, relief from headache was found to be equally effective in both the groups. Background: Obesity is considered the world's oldest metabolic disorder. It is not a single disease entity, but a syndrome with many causes including combination of genetic, nutritional and sociological factors. The World Health Organization (WHO) considers obesity as "Insidious, creeping pandemic which is now engulfing the entire world". Diet and life-style play a significant role both in the development and control of obesity Sthaulya (obesity). In Ayurveda, Acharyas have mentioned about the use of Lekhaniya Vasti to manage the Sthaulya. Aim: To evaluate the efficacy of Lekhaniya Kashaya Vasti in patients of Sthaulya. Materials and Methods: A total of 70 patients of Sthaulya were registered. Further they were divided into 2 groups each having 35 patients. In Group I (Lekhaniya Kashaya Vasti) group out of 35 patients 32 and in Group II (Pathya) group out of 35 patients 33 completed the follow-up. Results: In Group I, mean change was observed in body mass index (P < 0.001), waist hip ratio (P < 0.001). Overweight (P < 0.001), Kshudraswas (breathlessness) (P < 0.001) and Nidraadhikyata (excessive sleep) (P < 0.001) which is statistically significant in comparison with Group II. Conclusion: Trial drug is very good combination for Medoghna activity. Background: Shad Karanas mentioned in Ayurveda are the means for attaining the state of Dhatusamyata. Samavaya is the sixth Karana among these and it provides the knowledge of relation between Dravya, Guna and Karma. This kind of knowledge becomes the basic tool in the field of diagnosis as well as in the selection of proper drug. Aim: To assess the Samavaya relation between Ama and its Hetu and Lakshanas along with Practical evaluation of Samavaya by using Pippalimula on Ama. Materials and Methods: The study comprising of total 23 patients of Ama and divided into two groups. Pippalimula tablet (each of 500 mg, 2 tablets four times daily) was administered in Group A (n = 13) while Group B (n = 10) was treated with placebo tablet (each of 500 mg, 2 tablets four times daily) for the duration of 10 days. Results: After the completion of treatment, all the parameters of Group A showed statistically highly significant results, whereas in Group B some parameters showed significant results and others were insignificant. Conclusion: The study specified the Karanatva of Samavaya as the Laghu, Ruksha and Ushna Gunas which were present Samavayatvena in Pippalimula, and were absent in placebo. Background: Dental caries is the most common complaint encountered in clinical practice. Virtually every adult in the world has experience of dental caries. It affects almost 80% of the population. It is now being viewed in dual perspective- "caries as a disease" and "caries as a lesion". Aims: To evaluate the efficacy of Triphaladi Gandusha for its anti-caries activity and improvement in Oral Hygiene Index in high risk patients of dental caries and to compare the efficacy of prevalent method of mouth rinsing and classical method of Gandusha. Materials and Methods: The study was conducted in 40 patients, 20 in each Group-1 and 2. Group -1 was given prepared Triphaladi mouthwash (mouth rinse) while Group-2 was given Triphaladi Kwath for Gandusha (retention). Results: The effect of treatment was assessed by subjective and objective parameters (like salivary pH, buffering capacity and microbial count). Triphaladi Gandusha (retention) in Group - 2 provided better results in the improvement of Ruja (toothache), Dantaharsha (tooth sensitivity), Sarambha (inflammation), pH of saliva, microbial count in salivary sample. And Triphaladi Mouthwash in Group - 1 provided better results in Srava (discharge), bad breath, pH of saliva and buffering capacity of salivary sample. There was no improvement in Chidrata (cavity formation), Krishnata (discoloration) and Chaladanta (mobility) with Triphaladi Gandusha and mouthwash. Conclusion: Study concluded that although both groups were effective, but Gandusha group patients' got better relief in subjective symptoms compared to mouthwash group. Background: It is increasingly being realized that many of today's diseases are due to "oxidative stress" that results from an imbalance between formation and neutralization of free radicals. Rasayana Chikitsa is a unique branch of Ayurveda. The word Rasayana means the way for attaining excellent Rasadi Dhatus. Several medicinal plants have been described as Rasayanas in Ayurveda. Ashwagandha and Guduchi are the best among the Rasayanas described by Charaka. Aim: To study the efficacy of Ashwagandha and Guduchi in oxidative stress in healthy volunteers. Materials and Methods: The study was carried out on 30 healthy volunteers after obtaining written informed consent. They were randomly distributed in three groups. Each group was treated with three different colored capsules containing Ashwagandha, Guduchi and placebo in the dose of 1 capsule (500 mg) twice a day for 6 months. The parameters such as hemoglobin%, Erythorcyte Sedimentation Rate (ESR), Malondialdehyde (MDA), Super-Oxide Dismutase (SOD) level, etc., were assessed before and after treatment. The Student's t-test was applied to assess significant variations in all of the studied parameters. Results: In this study, there was a significant increase in SOD level and decrease in MDA level in Ashwagandha and Guduchi groups. Conclusion: Ashwagandha and Guduchi may be helpful in preventing the oxidative stress and premature aging. Background: Vyanga is one of the Kshudraroga, characterized by the presence of Niruja (painless) and Shavavarna Mandalas (bluish-black patches) on face. It is one of the most common diseases as regards the face is concerned. 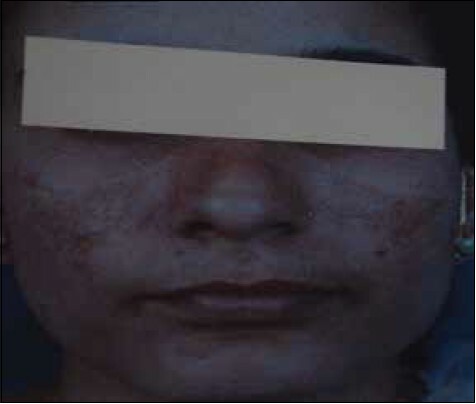 On the basis of clinical features, it can be compared with facial melanosis, one of the hyper pigmented disorders. Drugs with Rakta Prasadaka, Twak Prasadaka and Varnyakara properties are helpful in the management of Vyanga, that pacifies aggregated Doshas and help in Raktashodhana (blood purification). Aim: To evaluate the efficacy of Arjunatwak Lepa and Panchanimba Churna in Vyanga. Materials and Methods: In this study, the trial drugs used were Arjunatwak Churna for Lepa (tropical application) and Panchanimba Churna for oral administration. A total 30 patients of Vyanga were selected from outpatient department and inpatient department of Shalakya Tantra Department and allotted randomly in two groups. In group-A, the patients were treated with external application of Arjunatwak Churna and Madhu for 21 days, while in group-B, patients received Panchanimba Churna orally for 21 days in addition to Arjunatwak Churna for Lepa. Effect of therapy on chief complaint i.e., bluish-black pigmentation in Group A was 60% relief, while in Group B 80% relief was found. Conclusion: The clinical study has shown that combined therapy gives better results than topical treatment. Background: Jyotishmati (Celastrus paniculatus Willd.) is a woody climber belongs to the family Celastraceae; a well known herbal nootropic, distributed through the tropical and subtropical regions of India. Its leaves are used in eye disease and headache. Very low qualitative and quantitative information about leaves have been documented to establish its quality and purity. Aim: Present study was conducted to evaluate physicochemical, phyto-chemical and HPTLC analysis of different solvent extracts of the C. paniculatus leaves. 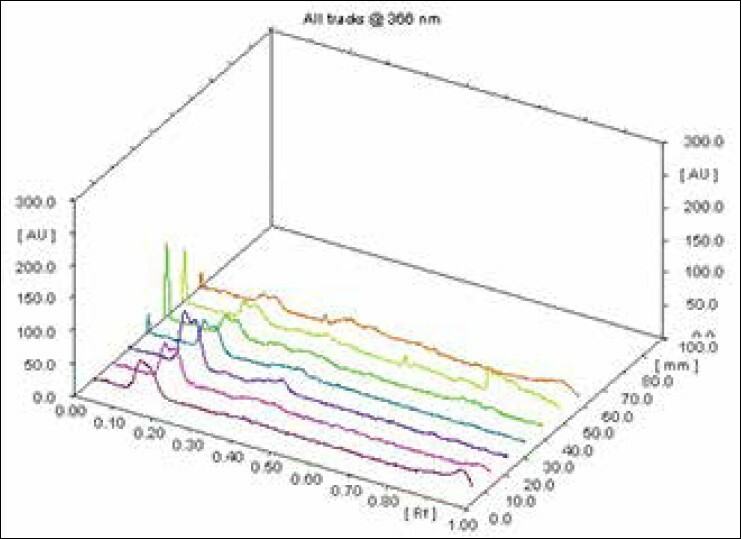 Results: Physico-chemical analysis revealed loss on drying 13.05% w/w, total ash value 16.08% w/w, acid insoluble ash 0.386% w/w, water-soluble extractive 14.22% w/w, alcohol-soluble extractive 9.91% w/w, chloroform-soluble extractive 7.75% w/w and ether-soluble extractive 4.74% w/w. Phytochemical screening showed the presence of steroid and terpenoid in the both pet. ether and ethyl acetate extracts while methanol extract possessed steroid, terpenoid, carbohydrate, alkaloid, saponin, and phenolic compounds. Conclusion: The observations made in this study may help to develop the standards of qualitative and quantitative parameters with regards to identification, quality and purity of C. paniculatus leaf. Background: Keshanjana (collyrium) is a well known Ayurvedic preparation prepared out of Keshamasi (ash prepared by scalp hairs) mixed with Goghrita (cow's ghee). 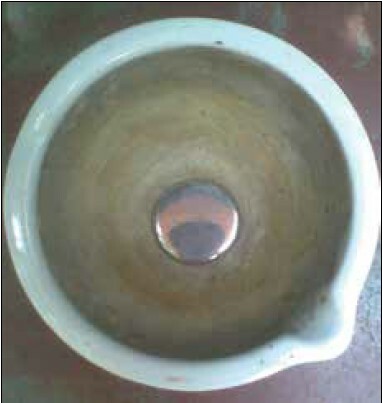 This medicine is indicated for the treatment of Shushkakshipaka (dry eye syndrome) in the classical literature of Ayurveda; hence, it was under taken for standardization and clinical evaluation in an extra-mural research project from Central Council for Research in Ayurvedic Sciences, Department of AYUSH, New Delhi. Aim: To develop standard quality parameters for the Keshamasi, Keshanjana and Keshamasi ointment. Materials and Methods: Scalp hairs of male and females collected from saloons were converted to classical Masi Kalpana and mixed with cow ghee and petrolatum in the ratio of 1:5 to prepare the Keshanjana and Keshamasi ointment respectively. Standard Operation Procedure (SOP) were adopted and recorded accordingly. 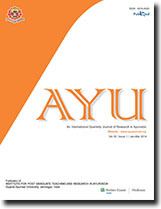 The raw material, furnished products and plain Goghrita were subjected for quality control parameters i.e., physico-chemical evaluation, anti-microbial study, particle size analysis, heavy metal analysis through inductive couple plasma spectroscopy with high performance thin layer liquid chromatography fingerprints. Results: Rancidity was negative in all the samples, indicating that the physico-chemical parameters are in acceptable range. Lead and zinc were present in most of the samples; while all samples are were free from microbial contamination. Conclusion: As no standards are available to compare the results of the current study, the observations cannot be compared. Thus the profile generated in the current study can be considered as standard to refer in future studies. Background: Rajata Sindura (RS) is a mercurial preparation, known for its properties like Rasayana (rejuvinating), Balya (strengthening), Vrushya (aphrodisiac), Medhya (increasing intellect) and can cure various diseases when used with appropriate adjuvant. It is prepared with Hingulottha Parada (purified mercury), Shuddha Gandhaka (purified sulfur) and Shuddha Rajata (purified silver) in a proportion of 1:1:4. Process standardization and characterization of RS are not reported until date. Aim: Pharmaceutical standardization and characterization of Rajata Sindura. Materials and Methods: Purified mercury and silver were triturated to form amalgam, followed by the addition of purified sulfur to prepare Kajjali and lavigated with Vatankura (leaf buds of Ficus benghalensis Linn.) swarasa (juice). This Kajjali was processed by Kupipakwa method. Results and Conclusion: RS was prepared in 33 h with 20.25% yield. Scanning electron microscope coupled with energy dispersive spectroscopy analysis has shown Mercury 86.21%, sulfur 13.27% as major elements; iron, calcium, potassium, magnesium and silver were other detected minor elements. X-ray diffraction report revealed the chemical nature of RS as HgS compound, having cubic crystal structure. Background: Origanum is one of the over 200 genera in the Lamiaceae (mint family), and this genus includes culinary, fragrant, and medicinal properties. The plant is reported to contain anti-microbial properties, but it lacks combination studies with that of synthetic antibiotics. Aim: To investigate the anti-oxidant and anti-microbial interaction studies of Origanum vulgare with standard drugs against Bacillus species of bacteria and Aspergillus niger. Materials and Methods: The anti-oxidant properties of phenolic, non-phenolic fractions of chloroform extract and volatile oil were evaluated by free radical-scavenging, hydrogen peroxide radical-scavenging assay, reducing power, and metal chelating assays. Results: The minimum inhibitory concentration and fractional inhibitory concentration index were determined which demonstrates the behavior of volatile oil, phenolic, and non-phenolic fractions of volatile oil with that of ciprofloxacin and fluconazole. 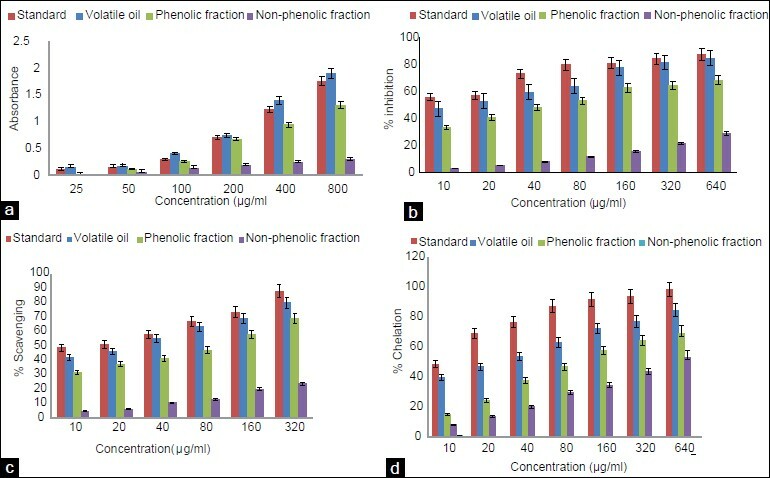 The IC 50 value for volatile oil was found to be 15, 30, and 30 μg/ml and that of phenolic fraction was 60, 120, and 120 μg/ml for free radical-scavenging, hydrogen peroxide-scavenging, and metal chelating assays respectively. 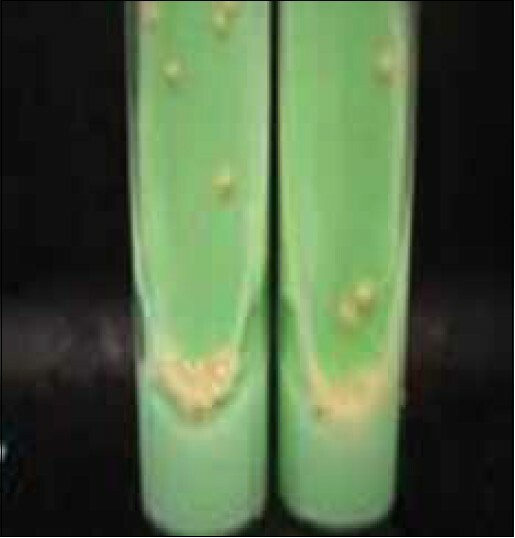 Non-phenolic fraction was found to act antagonistically along with ciprofloxacin against B. cereus and B. subtilis, while the phenolic fraction exhibited indifferent activity along with ciprofloxacin against both the bacterial strains. Conclusion: This combination of drug therapy will not only prove effective in antibiotic resistance, but these natural constituents will also help in preventing body from harmful radicals which lead to fatal diseases. Background: In Ayurvedic classics, two types of Laghupanchamula -five plant roots (LP) have been mentioned containing four common plants viz. Kantakari, Brihati, Shalaparni, and Prinshniparni and the fifth plant is either Gokshura (LPG) or Eranda (LPE). LP has been documented to have Shothahara (anti-inflammatory), Shulanashka (analgesic), Jvarahara (antipyretic), and Rasayana (rejuvenator) activities. Aim: To evaluate the acute toxicity (in mice), analgesic and hypnotic activity (in rats) of 50% ethanolic extract of LPG (LPGE) and LPE (LPEE). Materials and Methods: LPEG and LPEE were prepared separately by using 50% ethanol following the standard procedures. A graded dose (250, 500 and 1000 mg/kg) response study for both LPEE and LPGE was carried out for analgesic activity against rat tail flick response which indicated 500 mg/kg as the optimal effective analgesic dose. Hence, 500 mg/kg dose of LPEE and LPGE was used for hot plate test and acetic acid induced writhing model in analgesic activity and for evaluation of hypnotic activity. Results: Both the extracts did not produce any acute toxicity in mice at single oral dose of 2.0 g/kg. Both LPGE and LPEE (250, 500, and 1000 mg/kg) showed dose-dependent elevation in pain threshold and peak analgesic effect at 60 min as evidenced by increased latency period in tail-flick method by 25.1-62.4% and 38.2-79.0% respectively. 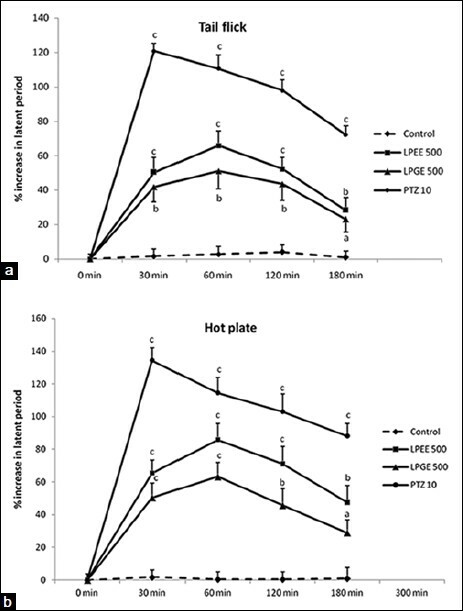 LPGE and LPEE (500 mg/kg) increased reaction time in hot-plate test at peak 60 min analgesic effect by 63.2 and 85.8% and reduction in the number of acetic acid-induced writhes by 55.9 and 65.8% respectively. Both potentiated pentobarbitone-induced hypnosis as indicated by increased duration of sleep in treated rats. Conclusion: The analgesic and hypnotic effects of LP formulations authenticate their uses in Ayurvedic system of Medicine for painful conditions. Background: A critical outcome of periodontal diseases is degradation of collagen in the periodontal tissues, by enzymes such as Matrix Metallo-Proteinases (MMPs). Doxycycline is known to down-regulate the activity of MMPs. Azadirachta indica (Neem) and Aloe vera are herbs known to have an anti-inflammatory effect. The present study was designed to evaluate the anti-inflammatory effect of Neem and Aloe vera by way of its inhibitory effect on MMP-2 and MMP-9 activity in cases of chronic periodontitis and compare it with doxcycline. Materials and Methods: A total of 30 subjects were enrolled in this study. 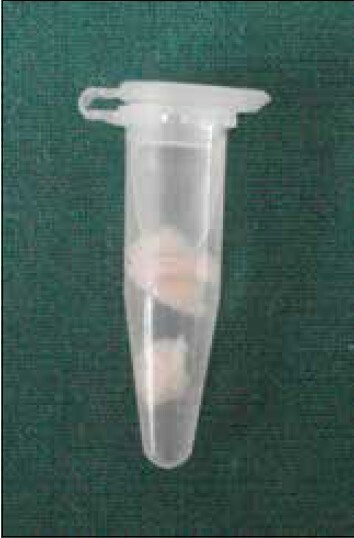 Gingival tissue samples were obtained from patients diagnosed with the chronic periodontitis. The tissue extracts were treated with the said drug solutions and inhibition of MMP-2 and MMP-9 was analyzed. Enzymatic activity was detected by electrophoresis. The data was subjected to Student's paired t-test. Results: The results showed that the activity of MMP-2 and MMP-9 was significantly decreased by the use of doxycycline, Neem and Aloe vera. A 53.5% reduction in the MMP-2 and 52.5% reduction in the MMP-9 activity was seen when samples were subjected to Neem treatment at the concentration of 1500 μg/ml. Tissues treated with Aloe vera in the concentration of 2000 μg/ml showed a 20.09% reduction in the MMP-2 and 20.4% reduction in the MMP-9 activity. Doxycycline in the concentration of 300 μg/ml, showed an 82.1% reduction in the MMP-2 and 82.6% reduction in the MMP-9 activity. Conclusion: The present study demonstrated an inhibitory effect of Neem and Aloe vera on MMP-2 and MMP-9, which are involved in the extracellular matrix degradation during periodontitis. Background: The effects of antidepressant treatments have traditionally been discussed primarily in terms of effects on noradrenergic and serotonergic systems. Multiple lines of investigation have also explored the role of dopaminergic systems in mental depression. Seed of Mucuna pruriens Linn. (DC) (Leguminoseae) is well-known with dopaminergic action and has several therapeutic applications in folk medicine in curing or managing a wide range of diseases including Parkinsonism. Aim: To elucidate the anti-depressent profile and possible dopaminergic modulating action of M. pruriens seeds in various experimental models of depression. Materials and Methods: In the present study, antidepressant effect of the hydroalcoholic extract of the M. pruriens seeds (MPE) (100 and 200 mg/kg, p.o.) was investigated in the Forced Swimming Test (FST), Tail Suspension Test (TST), and Chronic Unpredictable Mild Stress (CUMS) test in mice. Further, dopaminergic interaction of same doses of MPE in the FST and TST were checked by the administration of a haloperidol (0.1 mg/kg, i.p.) and bromocriptine (2 mg/kg, i.p.) on the 7 th day of MPE treatment. Effect of MPE on locomotor activity was also checked using actophotometer. Results: MPE produced a significant reduction of the immobility time in the FST and TST. Further, antidepressant action of MPE was significantly inhibited by haloperidol and potentiated by bromocriptine in the FST and TST. 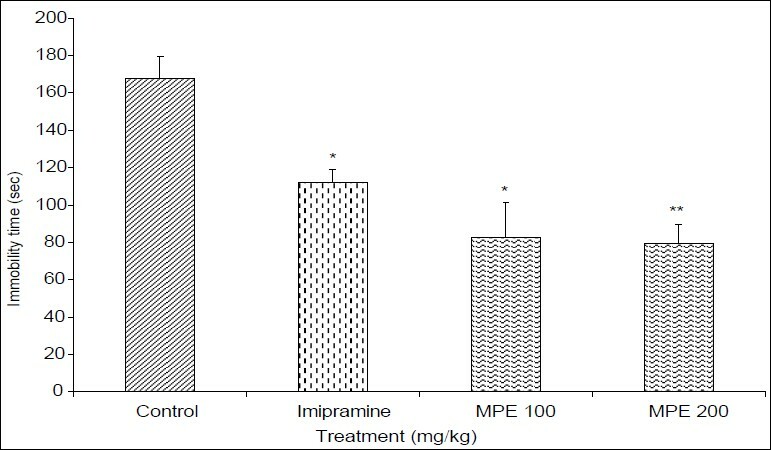 21 days of MPE treatment produced protection in CUMS as indicated by a significant increase of sucrose intake of stressed mice. Locomotor activities of mice were not significantly changed after 1 h and 7 th day of the MPE treatment. Conclusion: The results of this study indicate that hydroalcoholic extract of MPE have antidepressant action, which may be mediated by an interaction with the dopaminergic system. Background: Tuberculosis is a leading cause of death in the world. A new alternative for the treatment of tuberculosis is urgently required, due to the emergence of multidrug resistant Mycobacterium tuberculosis. Aim: There is currently considerable interest in developing potential drugs from medicinal plants for treating tuberculosis. To evaluate anti-tubercular activity in the leaves of Kingiodendron pinnatum Rox. Hams., Humboldtia brunonis Wall., Indigofera cassioides Rottl.ex DC., Derris scandens Benth. and Ceasalpinia mimosoides Lamk. Materials and Methods: Non-polar and polar solvent extracts of leaves of these medicinal legumes were tested against M. tuberculosis H37RV and minimum inhibitory concentrations (MICs) were determined by the agar based proportion assay. Results: Phytochemical screening for secondary metabolites revealed the presence of saponins, steroids, anthro-quinones, terpinods, flavonoids and phlabotanins. Crude leaf extracts of these plants have shown MIC value of 50 μg/ml as against the standard drug Isoniazid value of 0.025 μg/ml. Conclusion: Results showed that crude extracts of legume leaves screened exhibited potential anti-tubercular activity against M. tuberculosis and further work is required to identify the active molecule of these legumes, to get a novel anti-tubercular drug. This is the maiden finding on anti-tubercular activity of these medicinal legumes. Background: Herbal medicines are the oldest known form of medicine in the world. However, the quality control and the assurance still remains a challenge because of the high variability of chemical components. Herbal drugs, singlely or in combinations, contain numerous compounds in complex matrices in which no single active constituent is responsible for the overall efficacy. This creates a challenge in establishing quality control standards and the standardization of finished herbal products . Many formulations have been mentioned in Ayurvedic text for Vrushyatwa (aphrodisiac). Puga Khanda is one among such formulations. Aim: To develop preliminary physico-chemical profile of Puga Khanda. Materials and Methods: Puga Khanda was prepared in three batches as per the classical reference mentioned in Bhaishajya Ratnavali. The formulation was subjected for physico-chemical analysis, phytochemical analysis and Thin Layer Chromatography (TLC). Results and Conclusion: The study revealed that organoleptic characters, pH and extractive values of all 3 samples were almost equal. All the samples had 60% of sugar needed for preservation and 2/3 rd of it was non reducing sugar. The total alkaloids ranged from 0.002 to 0.004% w/w. In TLC study the entire samples showed similar pattern except the 2 nd sample of Puga Khanda.